Elisha D'Alembert Blakeman and Tabitha Babbitt were members of the Shaker communities in New Lebanon, New York, and Harvard Massachusetts, respectively. Blakeman invented, among other things, a single-stringed tabletop instrument called the "piano violin," which he patented in 1871. He used the instrument to proselytize and draw people in to the Shaker community. However, he ran into resistance in this activity from the elders in his community, who discouraged him from continuing. After much deliberation, Blakeman opted for life in the wide world with his instrument over the prospect of life in the peaceful community of New Lebanon without it. 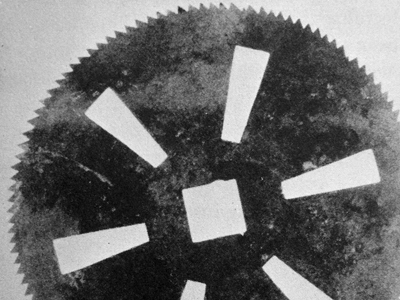 Babbitt, an equally creative soul, made her contribution to the industrial revolution with the invention of the circular saw in 1810. In this piece, a pair of electric skis (monochords built from skis) are laid flat and bowed using another pair of skis. The speed of the bowing gradually slows, so that tiny and detailed fluctuations of the strings are heard. Mimicking the motion of feeding wood into a table saw, the bowing movement alludes to crosscutting while its slowing speed cuts ever deeper into the grain of the strings.